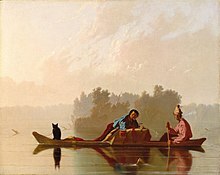 Speaking of George Caleb Bingham's (CIWT yesterday), his work is a classic example of the fickleness of the art market. When he died in 1879 his art was languishing in obscurity. Then in the 1930's it was rediscovered and he is now considered one of America's greatest early realist painters who hauntingly evoked an era of American history. His most famous canvases portray the hardscrabble life along the Mississippi and Missouri Rivers in the decades just prior to the Civil War. Except, from the viewing would you call the scenes before you hardscrabble? Hardly. 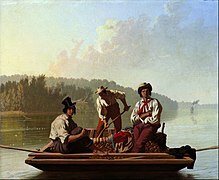 The River people were ruffians but as portrayed by Bingham they are almost genteel floating serenely along calm waters in clear weather and even dancing and playing games. In other words, Bingham hasn't so much captured the West as tamed it and given its inhabitants and way of life luminosity and timelessness. For whatever reason - possibly his own joyful, optimistic nature - Bingham chose sensitive, patient artifice over reality for his River paintings, and Ciwt, for one, treasures that wonderful artistic decision and each of his River paintings.